Our teaching laboratories are among the best equipped of any tertiary institution globally. They provide interactive microscopy, computing, and image analysis which in turn enable peer-to-peer learning, real-time online integration of student findings and instructor feedback, and life-long educational impact. The School of Biological Sciences first-year biology laboratory is one of the best teaching facilities for biology in Australia. It is equipped with state-of-the-art computer facilities, multimedia resources and is designed to allow large and small group learning. Biology teaching laboratories at the School of Biological Sciences bring the full power of computing into everyday laboratory situations. 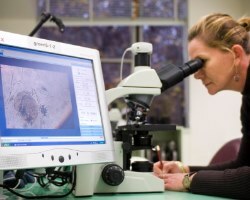 State of the art digital microscopy and software allow the teacher to transmit images, spreadsheets or programs from any computer or laboratory microscope to the whole class. Students can work at their own pace while still being able to share and join in with the class activity. This fully networked system now allows us to teach the most up to date methods of analysis and computing. The Jock Marshall Reserve was established in 1961 to provide a teaching and research resource for environmental studies on campus. The reserve was established by and named after the Foundation Chair of Zoology and Comparative Physiology, Professor AJ 'Jock' Marshall. The Jock Marshall Reserve has been used for undergraduate teaching exercises and external collaborative education programs. Students are able to access an extensive range of facilities such as fully networked teaching laboratory, controlled temperature rooms in environmental laboratories, a network of pitfall traps to survey terrestrial animals, and a 1 ha lake with purpose built piers for aquatic surveys.